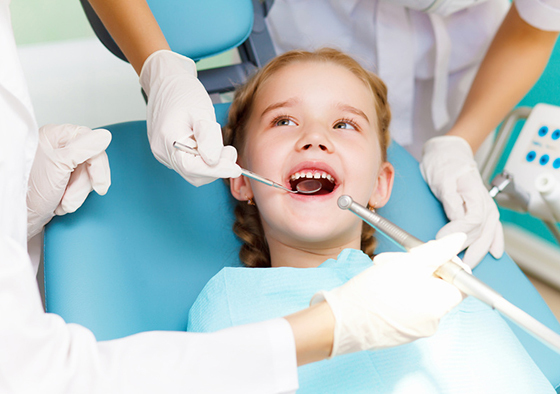 Child dentistry represents a special approach and work with children in order to overcome fears of the child, gain confidence in his dentist and make it easier to perform the intervention. Child dentistry also represents cooperation with parents and introduces the child, work on trust, child education, involvement in the care of teeth and gradual introduction into therapy. The first visit to the dentist is of great importance. It is recommended that the first dental examination is scheduled when the baby is one year old. Since the child usually has dairy teeth in that period, this visit is mostly focused on parents to educate themselves how to preserve the health of their children’s teeth. The most important reason for the visit is the prevention of caries of early childhood (caries of milk teeth). Early childhood caries (teeth caries) can be caused by taking food from the bottle during sleep or at night, as well as by continuous breastfeeding. It occurs when liquids containing carbohydrates remain on the teeth for a longer period of time. Schedule your first visit, dental exams and consultations are free. Lactating tooth decay usually occurs between 6 months and 3 years of age. During the emergence of primary (milk) teeth, gums can swell and inflammation may occur. In that case, it is good to seek the advice of a dentist. Milk teeth decay occurs very early, often as a result of bad habits, inadequate nutrition and parental neglect on the importance of dairy teeth and the ability to preserve their health . Caries often involve a large number of dairy teeth and spread rapidly. It’s also common to have complications of milk tooth decay. Look for a dentist’s advice on prevention, regular and proper hygiene maintenance, a change in bad habits in the diet, and procedures for the protection of teeth. In this way, you will preserve the health of your child’s tooth and prevent various complications and anomalies that may arise. We recommend three-month and six-month controls at dentist. The first permanent teeth arrives between the sixth and seventh year and they are most often the first permanent molars. If adequate oral hygiene is not carried out, the first stalks are very quickly affected by the caries decay process. Therefore, in this period, it is necessary as often as possible make a visit to the dentist. In the prevention of caries on permanent teeth, the process of watering fissures and wells is carried out. This preventative procedure should be carried out immediately after the tooth removal, or at least 6 months afterwards. Watering fissures is a completely painless intervention, which only takes a few minutes. Your child’s teeth are cleaned with a soft (soft) toothbrush and water. Children’s toothpaste – without fluoride can be used up to 2 or 3 years. Toothpaste with fluoride is not recommended until your child learns to swim when there is no longer any risk of swallowing toothpaste.